This is an optional terminal board for the TC-08. The screw terminals allow wires to be attached to the data logger without soldering and enable the TC-08 to measure voltages from 0 to +5 V, or 4-20 mA loop current. Although accurate temperature sensors are widely available, it has been difficult to find a measuring device that can take advantage of them without introducing excessive errors. The PT-104 USB, however, is inherently accurate due to its novel design. 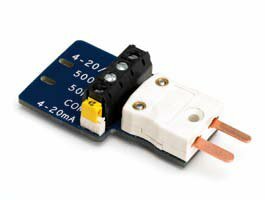 Rather than relying on voltage references (which tend to be temperaturesensitive) it uses reference resistors which are extremely stable (low temperature coefficient and drift). The exact value of each resistor is stored in an EEPROM to provide the ultimate in accuracy (yearly recalibration is recommended). To achieve the 0.001°C resolution, a highly advanced ADC is used that can resolve to better than 1 part in 16 million. 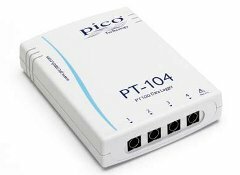 The PT-104 USB measures temperature using platinum resistance thermometers (PRTs). Both common industry standards (PT100 and PT1000) are supported. The unit is compatible with 2, 3 and 4 wire sensors (4 wire PT100 sensors are recommended for accurate measurements). A wide range of PT100 sensors are available for use with the PT-104. 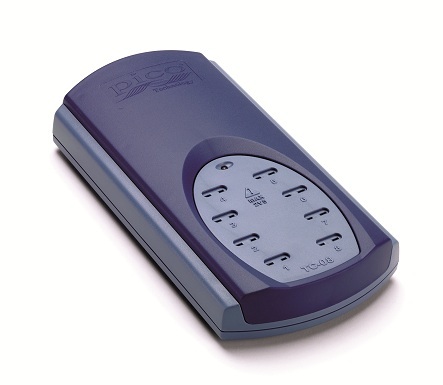 The PT-104 Screw Terminal Adapter is an accessory for the PT-104 Platinum Resistance Data Logger. 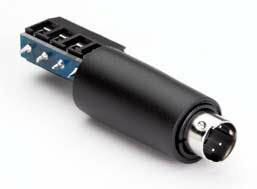 The adapter allows PT100 probes that are not fitted with a mini-DIN connector to be used with the data logger without the need for any soldering.